"Mother's Heart Charm Necklace, Little Bits of Love for Three Children"
Little bits of love mother's necklace is so precious. This necklace comes with three hearts to represent your three children. Sterling chain available in 16" or 18"
Count your little blessings with our mini silver or bronze hearts. Keep them close to your heart on our light dainty chain. You can more later if your family grows! 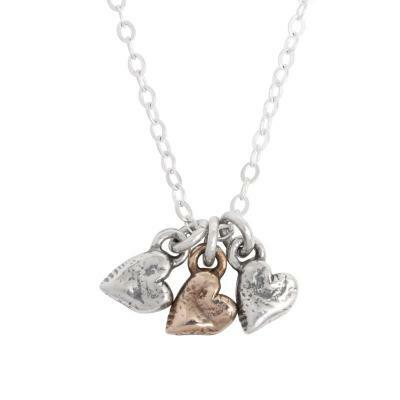 This mother's necklace comes with three hearts ~ perfect for a mother of three. Design your necklace with a heart for each child or grandchild or add more to represent the parents too. Do bronze hearts for boys and sterling for girls or keep it all the same color. Be creative and make this necklace a symbol of those you love. Hearts are sterling or bronze. The chain is sterling silver and is available in 16" or 18'. Dimensions: Heart charms are approx 2/8" x 2/8" and available in sterling and bronze.